11.15am – A radio message is announced by the British Prime Minister, Neville Chamberlain, that the British deadline for the withdrawal of German troops from Poland has expired. He says, the British ambassador to Berlin has handed a final note to the German government this morning saying that unless Germany announces plans to withdraw from Poland by 11.00am, a state of war would exist between the two countries. Great Britain has just declared war on Germany. World War 2 is about to begin. Europe is now on the brink of a huge catastrophe. American President Theodore Roosevelt vows to keep the United States out of a European war. Jamaica has been a British colony for nearly 300 years – Although it is much too far away from Europe to be directly affected in a European war, Jamaica automatically becomes involved due to it being a British Colony. Jamaicans soon begin to volunteer for military service in Great Britain. Up until now, British West Indians had not been allowed to settle on a large scale into Great Britain, not like they could do in America. In fact, Mass Teddy had once wanted to send his young children to school in England. However. None of the Hodgson family ever set foot in England. But this would all change because of the war. War continues to escalate in Europe but America is still not involved. Mass Teddy and Mabel’s children are all adults. They all live in Jamaica except for the two eldest, Ida Mae Hodgson and Maurice Hugh Hodgson who are both in New York, America. May Hodgson had previously studied to be a teacher. She went to Venezuela in 1922 on a teacher exchange. 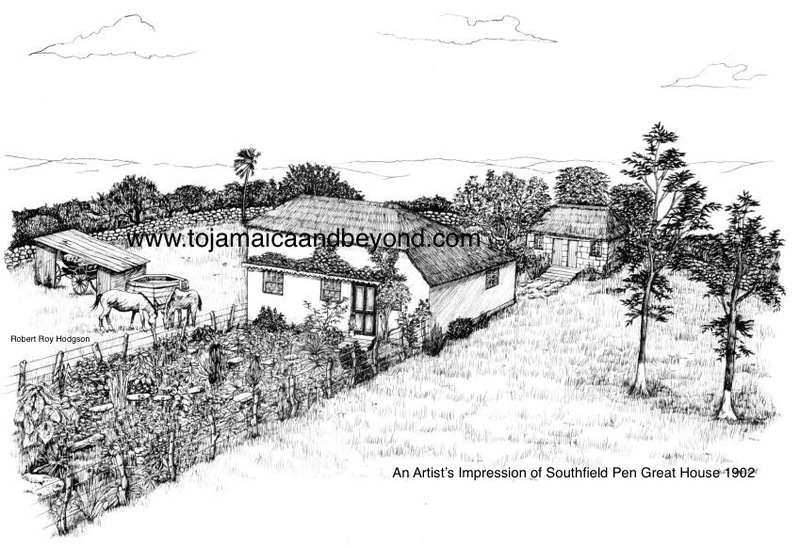 Then back to Jamaica before going to America in 1923. She is now a teacher there and married to a fellow Jamaican, George Redverse Burkley. They have three children. She has taken a Southfield memento with her to America – a handed down ‘family heirloom’ that has been in the Hodgson family for a long period and once belonged to her father’s Aunt. It is a gold pin brooch containing a lock of blond hair and is about 100 years old. May treasures this family heirloom. May’s brother, Maurice is also an American citizen in New York. He went there the year after his sister in 1924. Maurice is married and has two children. The eldest Maurice Vincent Hodgson was born 1923 at Southfield to Ida Powell. The youngest, Elinor Regina Hodgson was born 1932 to Edna Mae Shakes in New York. For a long time prior to the war breaking out, May Burkley (née Hodgson) had been trying to encourage all her siblings, John, Aubrey, Cecil, Linton, Leslie and Hortense all to come to America with her. None of them had gone there yet. One of them was my dads father, Aubrey Hodgson. He was a shopkeeper and lived with his grandmother Grace Emily McIntosh at her shop near Southfield. Aubrey adored and was very devoted to his moms mother, Grannie Gracie. She had died in 1937, two years before Great Britain declared war on Germany. Her death completely devastated Aubrey causing him to smoke and drink heavily. Previous Previous post: Why Run A Blog?